A silky sweet nose of vanilla gives way to tantalising base notes of musky sandalwood and patchouli in this luxury reed diffuser, one of the signature fragrances exclusive to our prized Fine Fragrance collection. 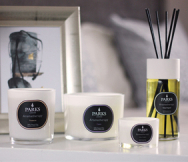 Infuse your living space with the sophisticated bouquet of vanilla, patchouli and sandalwood, perfectly paired scents that have become synonymous with our Fine Fragrance range. This luxury diffuser has been carefully made to deliver pure and long-lasting fragrance, enhancing your home with a natural blend of quality extracts. Smooth, warm, and comforting – sandalwood is one of the most popular home fragrance base notes, infusing your space with a rich, lightly-spiced scent. Patchouli helps to elevate this masculine base, adding a musky floral nose that brings character and complexity to the bouquet. To this intoxicating blend we add vanilla, whose light and satisfying scent make it one of the most beloved home fragrances available. The vanilla serves to add sweet notes of honey to the musky base notes of sandalwood and patchouli, creating a unique and captivating fragrance. One of the signature scents in our luxury Fine Fragrance collection, the Vanilla, Sandalwood & Ylang Ylang Diffuser is supplied in a luxury presentation gift box, and features natural rattan sticks which help to deliver up to 8 weeks of pure, long-lasting fragrance, no matter where you choose to place it in your home. All our Fine Fragrance diffusers feature carefully blended essential oils, enlivening your space with pure natural scents that transform any room in the home.